In this case, we want to combine search criteria to use in the Vlookup formula. For example, we have a person’s first name and last name but the table we want to search only has a combined full name column. The trick here is to nest a concatenation formula inside the Vlookup to combine the criteria prior to searching. It’s a regular Vlookup formula, with concatenated values as the first argument. We need to combine first name and last name before searching for the full name in the table. 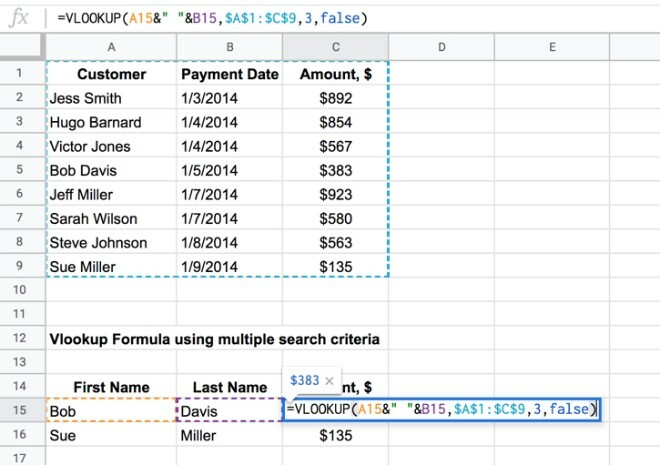 combines Bob in column A and Davis in column B into Bob Davis, which is the value we then search for in the table with Vlookup. Want a copy of the example worksheet? This scenario is the opposite way round to the first one. In other words we have a complete search term, but our search table has multiple columns that need to be searched. For example, our search term is the full name of someone, but the search table has a column for first name and a column for last name. In this situation, we can’t perform a standard vlookup. What we do is create a helper column in the search table, which combines the required columns to create a new search column. So we combine the first and last names to create a helper column containing the full name. The helper column is shown in yellow in the image above. 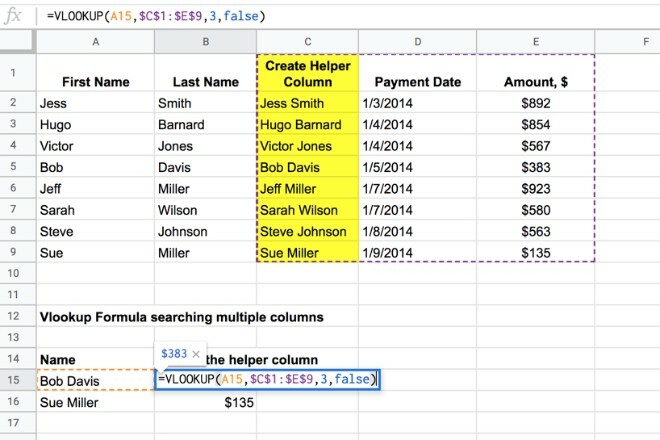 Then it’s simply a standard Vlookup using this helper column as the search column. This is exactly the same scenario as 2 above, but this time instead of creating a helper column directly in the table, we’ll use the Array Formula to do it all dynamically on the fly. Now we have created a new table with the full name column, we simply use this as the range input in a standard vlookup, as shown in the first image of Section 3 above. 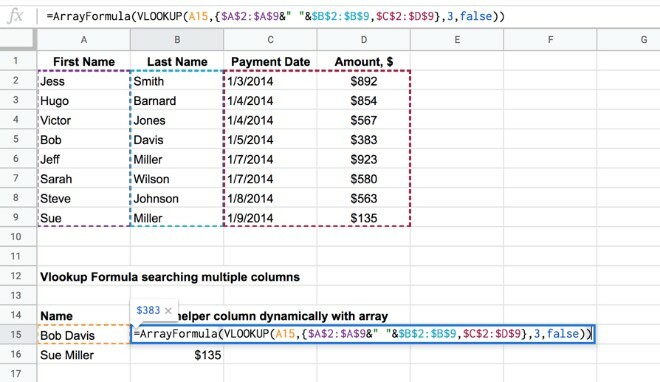 Notice that the Array Formula wrapper stays on the outside of the whole formula. 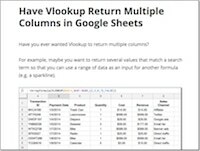 Have VLOOKUP return multiple columns in Google Sheets, with this quick and easy tutorial. 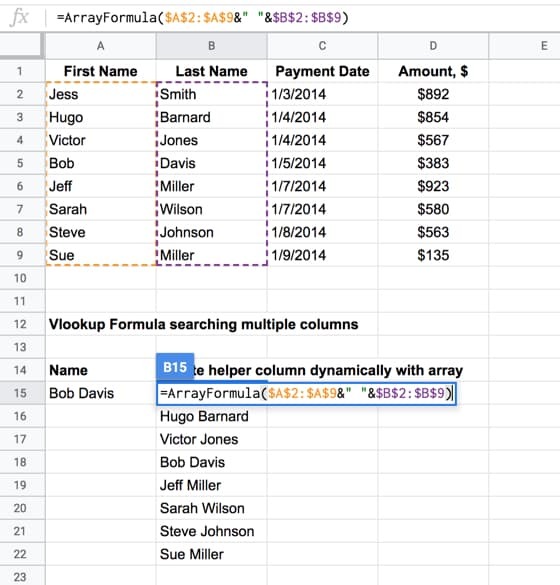 Use an Array Formula wrapper to Vlookup multiple columns. 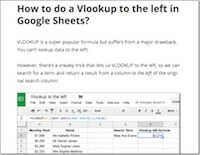 How to do a Vlookup to the left in Google Sheets? See how to create a new virtual table with an array, where the columns are switched, so the VLOOKUP can work on this new table. 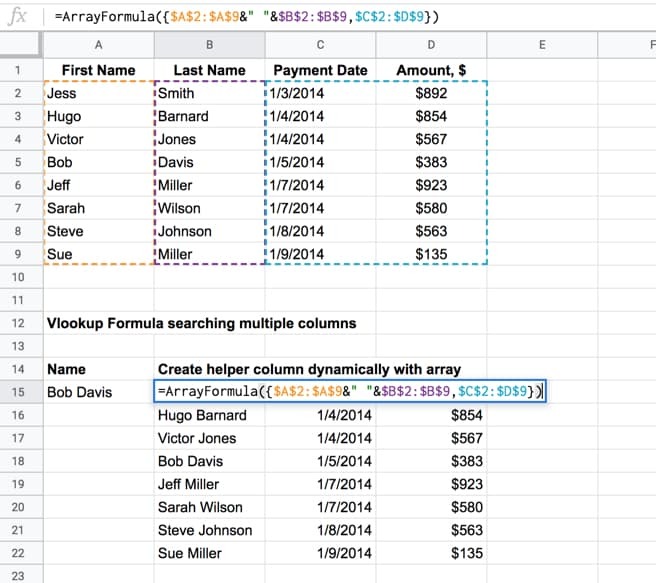 How do array formulas work in Google Sheets? 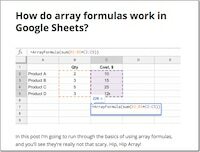 This post takes you through the basics of array formulas in Google Sheets, with example calculations and a worksheet you can copy.